^ Quickfacts.census.gov - Ontario County - accessed 2011-12-06. 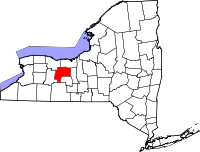 ^ Quickfacts.census.gov - Canandaigua, New York - accessed 2011-12-06. ^ Quickfacts.census.gov - Geneva, New York - accessed 2011-12-06. Turner, Eramus (1909). Pioneer History of the Holland Purchase of Western New York. Volume II.